Two days ago, the Cleveland Plain-Dealer reported that the Browns are expected to make an attempt to trade for Patriots quarterback Jimmy Garoppolo this offseason. Today, according to CBS Sports' Jason La Canfora, you can add the Chicago Bears to the list of likely Garoppolo suitors. 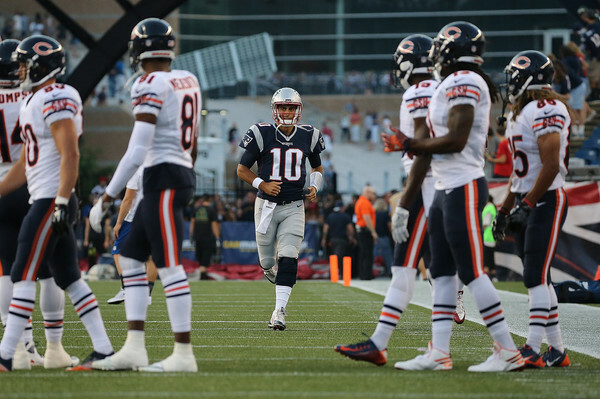 The Chicago Bears will make a strong, concerted effort to acquire quarterback Jimmy Garoppolo from the Patriots, according to sources with knowledge of the situation. The Illinois native is far and away their top offseason priority. With Jay Cutler almost certain to be a cap casualty this offseason and no quarterback of the future on the roster, the Bears interest in Garoppolo makes plenty of logical sense. They obviously liked what they saw of him last August, when the Patriots hosted the Bears for joint training camp practices prior to their preseason game. Bears GM Ryan Pace has already made three trades with the Patriots during his two years running the Bears and, like Garoppolo, played college football at Eastern Illinois, just a three hour drive from Chicago. From a Patriots standpoint, Chicago benefits as a potential trade destination by being an NFC team. The Bears currently hold the third overall pick in the 2017 draft, along with the fourth pick of the second and third rounds. While they don't have as many draft picks to offer as perennial AFC doormat Cleveland, they certainly have enough to make a more than competitive offer. This report indicates that momentum is growing for Garoppolo's trade market, which could heat up more as teams evaluate what's widely considered a lackluster draft class of quarterbacks. The 49ers are also expected to be in the market for Garoppolo, as presumed head coach Kyle Shanahan reportedly loved Garoppolo as a prospect in the 2014 draft (a sentiment shared by Pace, who was with the Saints at the time). Arizona would be another intriguing addition to his potential suitors should Carson Palmer decide to retire. Ultimately, the more teams known to be interested, the better for a Patriots club trying to maximize its leverage at the negotiating table. With all of these potential suitors desperate for a quarterback, the Patriots should be able to play these clubs against each other, raising the price for the best available quarterback of the offseason. If Super Bowl LI winds up being Garoppolo's last game as a Patriot, you can bet there will be significant assets coming back the Patriots way this offseason.